My husband thinks I should start rating my recipes as “Gary Approved” or not; as this recipe is not Gary Approved. I think it’s just a mental thing because I told him that they were made with black beans instead of flour before he even took a bite. That was my mistake. He doesn’t like them – but I’m okay with that because now I don’t have to share. Given the choice between these brownies & ones out of a box, or homemade; yes, the homemade ones will win every time, however these brownies have less than 100 calories per serving & I think they’re delish. 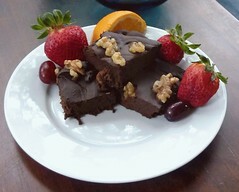 They allow me to have the indulgence of brownies without the guilt. They have the texture of flourless chocolate cake; dense, but light. They also have the added benefit that they’re all natural, almost 100% clean (depending on how you rate sugar), and have lots of fiber! Plus, because they’re made with black beans, they’re actually pretty filling, so you will only be able to handle 1 or 2 in a sitting! Preheat oven to 350 degrees F (175 degrees C). Lightly grease an 9 x 7 baking dish. Combine the black beans, eggs, oil, cocoa powder, salt, vanilla extract, sugar, and instant coffee in a food processor or blender; blend until smooth; pour the mixture into the prepared baking dish. Sprinkle the walnuts over the top of the mixture. ← Introducing: Health with Friends!